“Across the white immensity of an eternal winter, from one end of the frozen planet to the other, there travels a train that never stops. This is the Snowpiercer, one thousand and one carriages long” (Lob 3). This is how Snowpiercer Volume One: the Escape, or (in its original French title) Le Transperceneige begins its journey. Created by Jacques Lob and Jean-Marc Rochette, along with help from Benjamin Legrand, this dystopian graphic novel presents a society forced to live in the train, the Snowpiercer, to survive. Humanity, morality, and politics are addressed and challenged in the narrative, and by the end of the journey, it is unclear who or what will survive in this future. Snowpiercer Volume One: the Escape takes place in a future that is a snow-filled wasteland, and the human survivors aboard the Snowpiercer are starting to run out of necessities. The train is divided into different classes, and our protagonist, Proloff, is an escapee from the “Tail,” the end of the train with the poorest of this society. Along with an activist named Adeline, Proloff is escorted by the law enforcement of the train to the front of the train to meet with the President. As they travel through the different passenger carts, the readers can see the different types of living styles along with the hypocrisy and corruption of the train’s occupants. Ultimately, Proloff, Adeline, and the reader learn the true history of the train’s origins; by that point, the train is besieged by sickness. In the end, Proloff is the only one alive and it is clear that his story will not have a happy ending. In an interview with the LA Times’ HeroComplex, artist Jean-Marc Rochette discusses the influences behind this 1982 graphic novel; interestingly enough, it was the concern about “ecology” and not “politics” that influenced the message of the book (Clark). However, in covering the concerns about the environment, it also becomes a story that critiques the people who shape the environment. It is a story about man cut off from nature, and after destroying nature, it begins to destroy itself through social class. The message also becomes clear as the writing and the art depict the different sections of the train, and one cannot help but be drawn to and repulsed by the scenes and characters. A great achievement of this graphic novel is that it uses art to mimic travel and the repetition of the text about the train’s movement drew me into the story. I felt as if I was really going through the train, and I could see the differing lifestyles of the characters. One concern I had was my lack of interest in the main characters. I find dystopian fiction lacking in interesting characters and instead focusing on people as symbols. No characters are truly memorable, and the sole female character serves as a love interest rather than an individual. Snowpiercer Volume One: the Escape is a graphic novel I would recommend for people who enjoy philosophical discussion about human nature and are incredibly interested in the creativity of the dystopian genre. While Hugo Pratt’s character, Corto Maltese, has been a prominent player in the European comic scene, it is only recently that new translations of the stories have been available in English. In an interview with Michael Lorah of Comic Book Resources, Dean Mullaney notes that the graphic novels were written in Pratt’s native language, Italian, and published in French. Previous English versions relied on the French translations; EuroComics is currently working on a project to translate all the Corto Maltese stories to best re-create Pratt’s intent. While Mullaney states that it is the third volume of Corto Maltese’s tales, Corto Maltese: Under the Sign of Capricorn, is the first volume of a 12 volume translation project. The best way to describe Corto Maltese: Under the Sign of Capricorn is to describe it as a series of short adventures that are connected through various plot points and characters. The locations also change throughout the story as the characters travel to the Dutch Guianas, Brazil, Saint Kitt, and Honduras in 1916. The story concerns a young boy named Tristan Bantam who is looking for his half-sister, Morganna, as a part of protecting his recently deceased father’s company. Corto Maltese is recruited by Tristan as transportation and guide in his quest. Rounding out the cast is Professor Steiner. During their travels, they run into magicians, rebels, immortals, lawyers, colonial soldiers, and even old enemies of Maltese. Based on the praise on the book jacket and the information provided in the introduction and author’s page, it is clear that Hugo Pratt was an influential figure in the field of graphic novels. The character of Corto Maltese has continued to endure even after Pratt’s death in 1995. While I had never heard of Pratt before beginning my research into European graphic novels, I can see why his work is well respected. The artwork is distinctive, and the dialogue, while short, contains a great deal of wit and creativity. It is also a graphic novel that takes chances in its storytelling, as dream sequences stand side by side with adventure and political intrigue. Another interesting aspect of the story is the depiction of the world. While there are areas of the graphic novel that may not work as well today as they did back then, it is clear that Pratt has a respect for different cultures; He also has a political message of anti-colonialism in his works. It is a world filled with people from different walks of life, but the main antagonists are a part of imperialistic forces. However, there were some concerns I had during reading. Since this is technically the third volume about Corto Maltese, I was confused at mentions of Maltese's past. I also felt as if the story could be improved if annotations regarding the locations and references were provided. It was an entertaining story, but I felt as if I missed parts of it due to lack of information. I would recommend this graphic novel and the further adventures of Corto Maltese, for anyone who likes adventure comics of the 30s, 40s, and 50s. I would also recommend it for audiences interested in exploring European comic culture. Logic is one of the key components of our world, and many discoveries in math and science stem from it. However, what about the mathematicians who studied logic? How does rationality (or irrationality) figure into their discoveries? 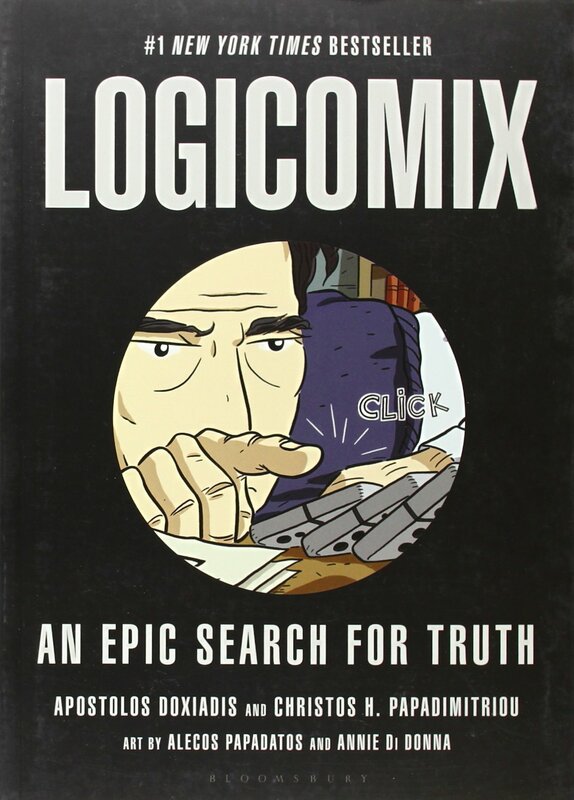 Logicomix is the product of the work Apostolos Doxiadis, Christos H. Papadimitrioou,Aalecos Papadatos, Annie Di Donna, Dimitris Karatzaferis, Thordis Paraskevas, and Anne Bardy put into researching logic, mathematics, and one of the famous researchers in the field, Bertrand Russell. The result is a graphic novel that does not fit comfortably into one particular category. Is it a text designed to educate readers? Is it a story about a quest? Is it a biography? Is it the story of creators trying to tell a story? Logicomix contains all of these stories, and manages to create a cohesive and interesting narrative. Logicomix has three stories interwoven in its tale. The framing device of the graphic novel is about the drafting phase of the graphic novel; It starts with a beginning that breaks the fourth wall as Apostolos Doxiadis addresses the audience. The main creators (Apostolos, Christos, Alecos, and Annie) are in Athens, and while Apostolos, Alecos, and Annie are intrigued by the emotional direction of the drafted story, Christos, a professional mathematical logician, acts as the critic of the story. The second story is a 1939 lecture of Bertrand Russell, a man known for his work in logic, mathematics, pacifism, and social justice. During this lecture, he explores the concept of logic, and poses a question: “what is logic?” (Doxiadis, etc. 35) The third story is the actual content of the lecture which concerns Russell’s own personal history. While the lecture only contains references to that history, the graphic novel expands on those events for the benefit of the reader. While the story is a graphic novel, it uses a chapter structure to divide the plot. While this could serve as a disruption to the flow of the narrative, it actually aids the pace of the story. Logicomix covers a great deal of information throughout; even by the end, it is clear that the story had to be modified and does not depict a complete history. The creators provide a glossary of terms and people at the end of the book, and this is a place to search for further information. It is also a graphic narrative that is challenging to read in one sitting, especially if you are unfamiliar with some of the topics, such as myself. However, the focus on the personal and the little details in the art (such as the depictions of Russell’s aging), helped keep my interest. The art and words work together to keep the reader's attention. The narrative challenges the reader with questions, and even at the end, I am still pondering logic and whether or not people will ever completely understand it without going mad. I would recommend this graphic novel to people who are interested in logic, math, history and abstract concepts who also want to read about it in a way that prefers a narrative approach over a technical approach to storytelling. As a graphic novel, Logicomix provides an outlet for a story that may not have reached a larger audience beyond mathematical professionals. According to the Museum of Modern Art, the term “exquisite corpse” refers to “a game in which each participant takes turns writing or drawing on a sheet of paper, folds it to conceal his or her contribution, then passes it to the next player for a further contribution.” When the game is complete, a finished work is revealed to all the participants. 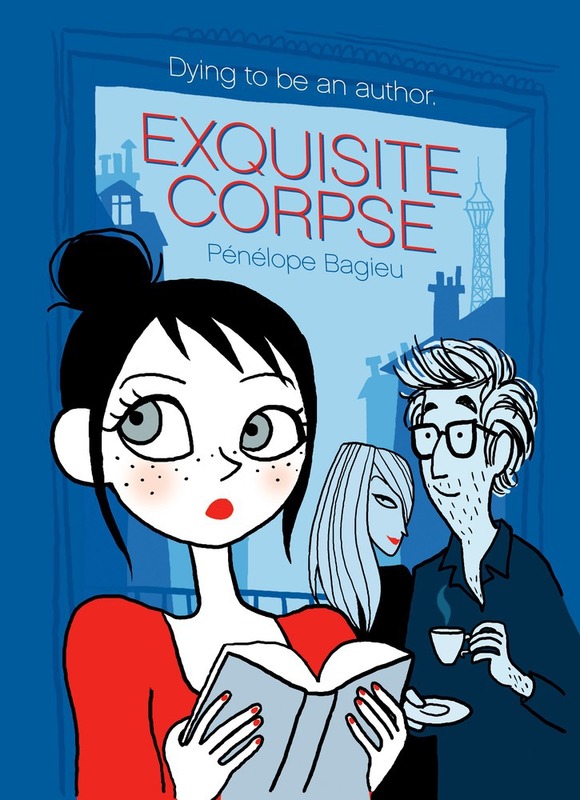 In her graphic novel Exquisite Corpse, author Pénélope Bagieu replicates this game through her art and characters as the plot unfolds. In a sense, Bagieu allows the reader to become an observer of this game, a role that the reader may not be aware of until the final image of the story. The story of Exquisite Corpse starts with Zoe, a 20-something, who is going nowhere in her job as a “booth babe” and in a poor relationship with her boyfriend. It is by chance that her life changes while on a lunch break; in the building across from her, she finds a man peeking out at her. Her curiosity leads her to meeting the mysterious man, who is named Thomas Rocher. In their first meeting, he is surprised (and intrigued) that Zoe does not recognize him as an author. A relationship begins between the two, and while at first it starts out pleasantly, Zoe begins to wonder why Thomas never wants to leave his place. She also begins to wonder about the relationship Thomas has with his publisher (and ex-wife) Agathe. In time, she learns that not only is Thomas Rocher a renowned and famous author, but that everyone else believes him to be dead. By faking his death and publishing “posthumous” works, Thomas gets the recognition he thinks he deserves, and Zoe learns she is his new inspiration. After this is revealed, Zoe begins to want to live her own life rather than live with a “dead” man. I do not wish to spoil the ending, but readers need to pay attention to all the pieces of art and dialogue to fully appreciate how the story pulls itself together. In the story, Bagieu paints a Paris of many colors, and it stands in contrast to the monotones of the closed world of Thomas Rocher’s apartment. Bagieu also demonstrates a strong ability to capture the unique emotions and feelings of her three main characters. This work manages to create an experience that leaves readers intrigued and invested in the story. It is also a story with a message as it weaves a tale that critiques the fictional trope of a young woman serving as a muse for an author throughout. This is my second time reading the graphic novel, and in a second reading, I gained a new appreciation for the story. As a narrative, it is worth the time to read a second time to fully appreciate the effort and work put into the story. My major concern is the brevity of the final act; it is the section that is the most powerful, but it is also too brief in comparison to the build-up. If you are interested in stories that are romantic but not traditionally romantic, this graphic novel is a recommended read. Join me next week for another review for Going Graphic with the European Union!